What to eat? The eternal question. Breakfast, lunch, dinner...so many options. Today sushi was in the mix, but that's been on my lunch menu all week. You know, the post Christmas must get healthy now thing. Hmmm, what about Vietnamese? I know Cay Tre opened up in Soho a little while back, and its easier to go there than to trek out to Old Street. When in Soho, we usually try to head for some udon noodles at Koya (www.koya.co.uk), but that's become so popular now. Weekend lunches were easier when I lived over east London way. And cheaper too! Song Que (http://songque.co.uk/) is my favourite Vietnamese in London, but its a bit of a hassle to get over there now. So, without even bothering with Koya, as it was 1.30pm already, a noodle soup at Cay Tre was deemed a decent alternative. 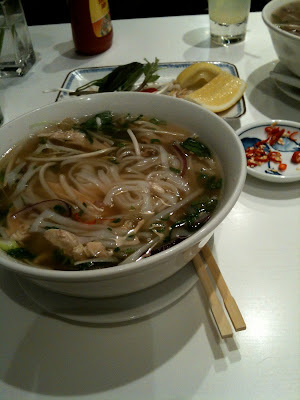 Pho. Mmmm. The ethereal ambrosial broth. Just what I need. They say first impressions count and the restaurant is definitely nicely kitted out. All clean lines and dark wood. We were then quickly shown to a dud table for two next to the serving station. No thanks. A more intimate table was secured and menus procured. We ordered beef pho, chicken pho, and some summer rolls. The summer rolls were unfortunately more lettuce than prawn and on the disappointing side, hence no pic. But the pho was pretty spot on. The beef tempted us with the promise of 'hangar steak, brisket and clod'. Mmmm, clod. The chicken was corn fed and was pretty tasty with the right amount of gristle to tell me it was the real deal. The only problem was with the herby condiments. No saw-tooth herbs, lemon instead of lime and the chilli came whole! I mean, what am I supposed to do with a whole birds eye chilli? Stir the soup with it? Wave the chilli at it? So, chopped chillis were quickly procured and calm was restored. Still, I was left with the feeling that the experience was dumbed down a bit on the relocation to Soho instead of the grittier streets of Old. This was also confirmed by the lack of locals in the place. Round eyes as far as my round eyes could see. Despite that misgiving, the soup was great. Lovely earthy flavours, particularly in the beef pho. Hunger satisfied and all for £28 (with two homemade lemonades). Cay Tre Soho is definitely a place I'll check out again, but I think my heart still lies on the Kingsland Road at Song Que. Got to run...Heston's chilli con carne is simmering away. Oh, that reminds me, I should tell you about the time I went to Dinner.